I’ve never been the biggest fan of rockabilly, psychobilly, or country-fed punkabilly, for that matter, so perhaps this review might be better coming from an enthusiast. It’s not, so I’ll do what I can. First, some background… One time, I was in The Washington, and a young international fellow approached me (I couldn’t for the life of me tell you where he was from, so I’m not even gonna pretend I thought he was Venezuelan for some reason), all exuberant, so he was. From what I could gather, he was adamant that I had the same hairstyle as Brian Setzer, and insisted on having his photo taken with me. That stuck with me, that moment. The kid was well-enthused, bless him. The day after, I looked into some Setzer stuff, and it didn’t do anything for me, so I went back to listening to Mogwai. Sometime later, I stumbled upon a copy of ‘Holy Roller’, and decided to give it a spin. It was pretty good, despite what her indoors always maintained: “They’re a bit… ‘Uncle Knobhead’, aren’t they?” and when faced with the likes of ‘Bales of Cocaine’, ‘Where In The Hell Did You Go With My Toothbrush’ and the splendid ‘Eat Steak’, it’s hard to argue. But, I’d argue, therein lays the charm of the Rev, his inventive turn of phrase and whimsical lyrics easily distracting from the welcome that his music often outstays. Fast-forward to now, and with our capitán now overseeing things from afar, and me offering to help out round here, I find myself listening to last month’s Rev, acutely aware that I’ve no real idea what I’m doing. Gone are the days of sarcastically dissing some band for being a soundtrack to Carling consumption. Now, I’ve got space to fill. I think my big issue with all this stuff-that-ends-with-billy is that to me, it’s good, at times really good, but man, does a little go a long way. I’d say the same about the bluesy-garage-ness of The Black Keys, to be honest (a 45 minute set at The Leadmill? An ample sufficiency. Two hours in an Arena-dome? Yawn. ), so file them alongside each other, as far as I’m concerned. Rev kicks off nicely enough though, with the high-octane ‘Victory Lap’ running a frenetic race around the fretboard that segues nicely into ‘Smell of Gasoline’, bringing ‘The Outsiders’ and its ilk immediately to mind. Mercifully, that’s where the detours into nostalgia end, and the rest of Rev is as rambunctious as I imagine fans have come to expect. It could do with a trim, but that’s more to do with my tolerance for this than it is their lack of editing. Despite myself, I can attest that this is certainly not boring. The Rev. has a knack of playing up to the limitations of this ‘billy genre, subverting them a bit then, sticking his finger in. It’s cheeky stuff, just get your laughing tackle round the likes of ‘Let Me Teach You How To Eat’, for proof of its finger-lickin’ goodness. 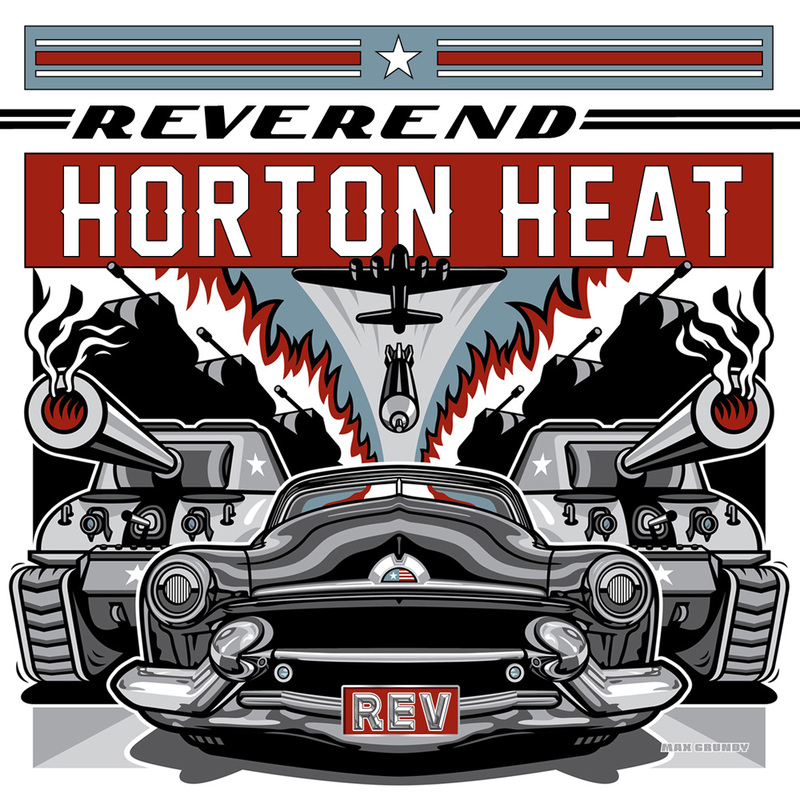 Reverend Horton Heat Website. Facebook. Twitter. Posted in reviewsTagged rev, Reverend Horton Heat, RockabillyBookmark the permalink.